As of January 15th, SHF&F is now able to accept all major credit cards for telephone orders and orders at the Amherst Farmers’ Market. Thanks to everyone who worked with us when we were only a cash/check based business. Your prompt payments, honesty and patience was admirable and SO greatly appreciated! SHF&F is now a Pro-Vendor on Wedding Wire! Visit our page to read reviews, view photos and get the latest Updates! We’ve partnered with Wedding Wire to bring our unique DIY flower program for weddings and events and studio floral services to brides and wedding and event planners. You can visit our page to get the latest reviews from brides and wedding planners who know our work and can back our high level of customer service, flexibility, skill and professionalism. We're Getting Smarter and More Diversified in 2019! Oh how we love to grow, not only beautiful cut flowers but our own skills and knowledge so that we can bring you the best quality flowers and the most relevant and gorgeous flower arrangements possible. What are we doing in 2019 to make this a high-impact year for professional development? Well first, we’re turning up the dial on our design skills and Sharon has enrolled in the Certified Floral Designer Program sponsored by the American Institute of Floral Designers. This intensive program includes a design evaluation program and sponsorship by members within the AIFD community. She’ll need the skills she will be learning from her enrollment in the New York Flower School Intensive and Advance Design series to help build the foundations for this program and further develop her intuitive skills with more formal training. While in NY, Sharon will also be participating in the New York Botanical Garden’s floral design program where she’ll develop new skills for mastering compote design, modernized sympathy arrangements and cascading bouquet construction from well-known designers. During these early months while the growing season is emerging, she plans to mix a little business with pleasure in her old stomping grounds in Center City Philly for the Philadelphia Flower show where she’ll be attending a design workshop with Master Frederic Dupre. While the schedule is packed during these cold winter months, we won’t forget about our core cut-flower operation. We’ve already been engaged with Cornell’s Tri-County Extension program by attending the Cut-Flower Conference and Sharon’s fully immersed in the Western Massachusetts Master Garden program where she is a 2019 Master Gardener Program intern. While it is a lot of work, its a great way to get through the winter. Before you know it we’ll be posting updates on the latest blooms and working around the clock to bring you the most beautiful flowers possible for your home, friend and events. Follow us on social media on Facebook (@sweethavenflowers) or Instagram (#sweethavenflowers) to see the inspiration we’re developing from expanding our minds and our skills during this early part of the year. Now you can have beautiful flowers year-round. SHF&F now offers standard arrangements for delivery. Custom orders are also welcome with advance notice (note: specialty items must be ordered a minimum of 3 weeks in advance to allow ample time for sourcing and delivery of flowers). To order call the farm at 413-628-3947, email us at wells@sweethavenfarm.com or fill out the inquiry form on our floral services page. 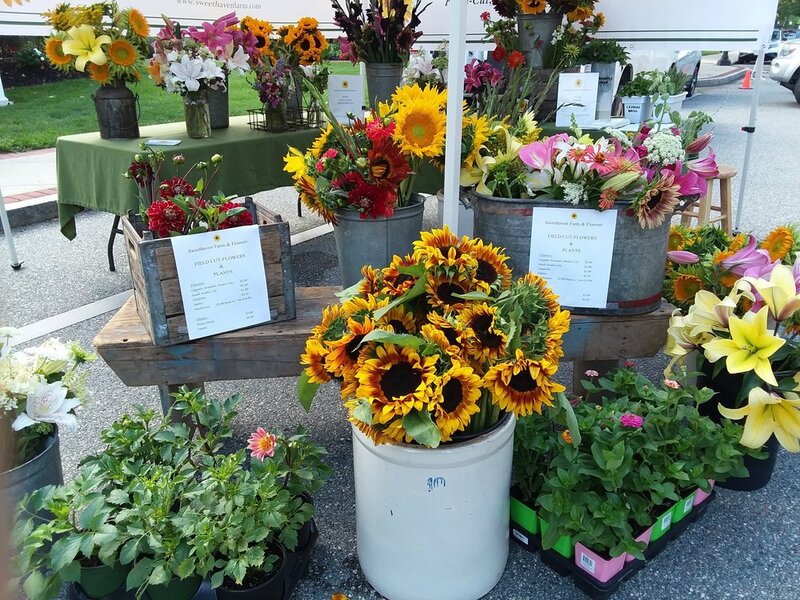 In a recent interview on CISA, "Sharon Wells of Sweethaven Farm and Flowers in Ashfield talks about switching from finance to flowers, reclaiming unused farmland with help from friends, and opening up their farm stand for the season". Click here to hear the full interview. 2018 FLOWER ORDERS: The 2018 event season is upon us and we are already booking dates. Don't forget to order flowers early and to "save the date" for events so we can be sure we hold the appropriate stock/quantities. Email us or call us for an order form and pricing. Just fill out the form and send to us at wells@sweethavenfarm.com and we will be in touch to discuss your plans and needs. 2018 FARMERS' MARKETS: We are excited to announce that SHF&F will be at the Amherst Farmers' Market and the Pittsfield Farmers' Market on Saturday mornings starting June 2nd! Look for bountiful seasonal flowers all summer long and our specialty heirloom pumpkins this fall at both of these great markets. Can't make it to the market? No worries, the farm stand will be open 7 days a week starting Memorial Day. Looking forward to seeing familiar faces and meeting new folks this season. Visit our Calendar on the "Find Us" page for a schedule of dates and venues.